You are invited to join the Kestle Barton team for a day of group gardening and a free, shared lunch. Our gardens come into peak in early July and it is a lot of work to keep the weeds at bay until the lush summer foliage and flowers take up their designated space in the beds. Our Gardeners do a fantastic job, but they are hard pushed to stay on top of the weeds alongside all the other responsibilities they have here. This year Kestle Barton is participating in the National Garden Scheme to raise money for charity. On Wednesdays throughout the season all our admissions donations will go to Cornwall Hospice Care. Our participation in this scheme has provided additional incentive to make sure the garden is looking the best it can at all times. 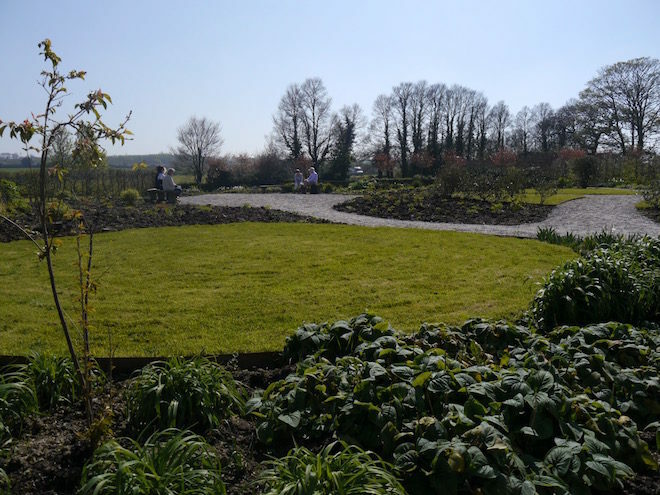 We have chosen Tuesday 17 April as an early season date so that we can get a head start on the weeds and we hope in this way to make it easier to manage until the plants have a chance to take over. Karen will be making a delicious lunch for everyone and we anticipate a great sense of communal atmosphere and camaraderie as we spend a day together in the garden doing light weeding together. Please ring 01326 231811 to join us in this effort. We look forward to weeding with you! 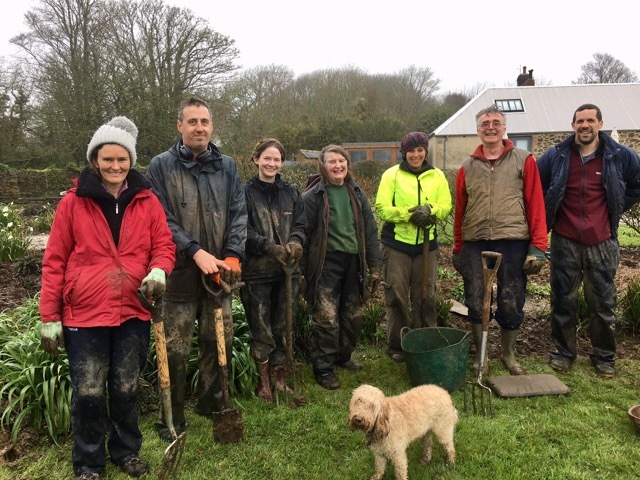 Not deterred by the wet weather, our team was joined by intrepid volunteers and we were able to clear a whole large bed of the young weeds before they could establish themselves. We enjoyed good company, welcomed tea breaks and a warm, homemade lunch. There was an immense sense of satisfaction at the end of the day and a shared desire for more opportunities to come together later in the season for more gardening.